Last year, Grace United Methodist Church went through a process called ReVision, where they develped a congregational mission statement. It states, "Christ in us...with us...through us." The youth of Grace United Methodist Church have found a way to incorporate that goal into their youth activities. They are doing an outreach ministry program this summer with puppets they call GUMppets. The name GUMppets comes from the church initials (GUM) and puppets. The Grace United Methodist youth are using puppet shows - called GUMppets - to reach new audiences this summer. 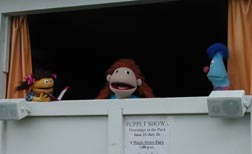 The youth will perform a new half-hour puppet show each Thursday afternoon from June 21 to July 26. Each program consists of three vinettes that are faith-centered but nondenominational. They are shown at 1 p.m. at the Maple Street Park, 1:45 p.m. at the Gazebo Park, and 2:30 p.m. at the Mobile Home Park each week. "The shows are based around basic Christian values," said Linda Jensen, director of youth and family ministries at Grace United Methodist Church and coordinator of the GUMppets shows. "What we are doing is sharing God's love by interacting with other children. Part of sharing God's love is demonstrating through puppets how people can treat each other with respect and honesty." Jensen said that the youth and herself looked for the puppet shows in books. The shows deal with a wide range of issues and aim to show children how they can be dealt with in a moral way. Topics include sibling squabbles, learning disabilities, and illnesses. The shows feature a lot of interaction between the audience and the puppeteers. The church youth ask the audience questions about the topics during the puppet shows and also sing songs with them. Often, young children are able to speak more openly to puppets than they can to people, according to Jensen. After one show about Bullhead Jones, a bully who is dealt with in a kind manner, one young girl started having a conversation with a puppet about her own experiences with bullies. When the puppeteer stood up, and the girl saw his face, she refused to talk to him. She wanted to talk to the puppet. Jensen said that seeing a scene played out is a more effective way to teach children values than to just preach. "Children can really relate to puppets," she said. "It's been a really wonderful tool. It's lots of fun." The performances are held out of a puppet wagon that was built by parishioner Larry Schultz. The parish youth painted the wagon with characters from the puppet shows. Puppeteers are: Greg Person, Cody Block, Megan Mackedanz, Theresa Hedeen, Lacey Bengtson, Kelly Herzberg, Jody Kelm, and Stacey Thomsen.